The Eskimo Nebula, or NGC 2392, is located about 4000 light-years from Earth in the constellation of Gemini. This cool space wallpaper shows the Eskimo Nebula, or NGC 2392, located about 4000 light-years from Earth in the constellation of Gemini. 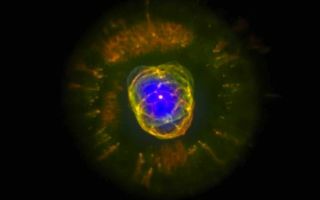 Hot X-ray-emitting gas detected by ESA’s XMM-Newton reveals the Eskimo’s blue face shining at 2 million degrees Celsius. It is framed by complex shells of ejected stellar material and a fur-lined hood, seen in optical wavelengths by the NASA/ESA Hubble Space Telescope (red and green).